Arguably the best college basketball tourney is about to get underway in New York…and this year everyone’s involved. For the first time in the history of the Big East Championship every team in the conference is invited to try to win the prestigious tournament. 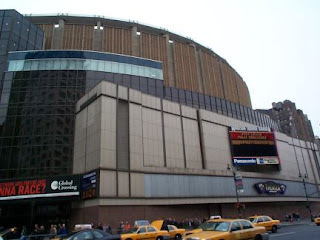 Even DePaul, 0-18 in league play, will have a chance to cut down the nets at Madison Square Garden. So, let’s preview the 1st round games. (16) DePaul vs. (9) Cincinnati: The Bearcats only hope for a trip to the Big Dance is a solid run in New York. It should start with a thorough beat down of DePaul. The Blue Demons are anything but demonic. Their last win came on December 28th when they took down Alcorn State…yes…that Alcorn State…Steve McNair’s alma mater. Expect Cincy to attack the basket early, and flex their physicality all night long. (13) St. Johns vs. (12) Georgetown: The Hoyas should kill the Storm…on paper. But Georgetown is also about the fifth best team in the conference…on paper. That’s why they play the games folks, and that’s too bad for the Hoyas, because they have no consistency, no offensive rebounding, and really no leadership. And just last week, the Storm beat G-Town in the Garden. The Hoyas need more from DaJaun Summers and Greg Monroe, especially on the glass. They can’t afford to be pushed around on the glass like last time. G-Town has to make a solid run if they want to dance…but too much disarray will derail them in the first round. (15) Rutgers vs. (10) Notre Dame: The bubbling Irish are looking to make classic New York run…and it could happen. The Domers should be able to handle the Scarlet Knights, essentially by outscoring them. Luke Harangody and Kyle McAlarney will be the key to making the tourney. Rutgers will struggle against the inside/outside game, which burned them earlier this year in South Bend. If the Irish pass this test, it’s on to WVU, where they match up quite well. Anything is possible (sorry Kevin) in MSG. (14) South Florida vs. (11) Seton Hall: Two teams with nothing to lose…two teams that could also give Syracuse a game in the second round. The Pirates actually have had a decent season. They should prove too much for a beat-up Bulls team that continues to roll with the punches in the Big East. Unfortunately, some of those punches knock them to the ground.